and be part of my creative journey..
well here I am with another tag ..no 8. for the funkie junkies twelve tags of Christmas 2012.
my inspiration came from Santa and the wonderful flower with bingo token centre..
inking tag in brown DI, and spritz and flick ..
and roughening edge with tonic tool and inking. this fab Santa component stamp is stamped on sticky back canvas. I added kraft snowflakes with wooden star centres. got a bit of a thing about these stars!!! I added crochet lace to continue the neutral and natural colours and feel..
and the centre a rusted bingo piece..
could I find no 25.....NO!!!! not at all like Linda's but definitely inspired by many elements of her tag..
just couldn't do red sorry!!!! p.s guess what?.. I did it!!! I made a tag with NO rock candy loose glitter!! Santa looks amazing on the sticky canvas, a nice tag Trace! A gorgeous tag, love all those wonderful details. Gorgeous tag... and no, I can't do red either - and I love your vintage neutrals! The flower looks beautiful, and I love the rusty bingo piece. One of the nicest Father Christmas stamps I've seen too - another great make, Trace! FAB-U-LOUS!!! Oh, this is absolutely stellar. I LOVE the stamping on the canvas, that is totally cool and I love the look you have achieved. The whole vintage look is crazy wonderful. Love that flower with its rusted BINGO token center too. You rocked #8 Trace! Thanks so much for joining in the fun. Fabulous tag! Love the fabric flower. I ♥ this tag .... well done! 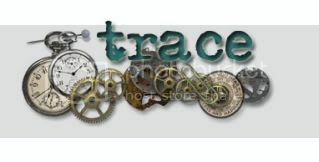 Another beautifully done tag -- I do love your art work Trace and that is exactly what is is - art. all of your designs are magical! Love your take!! Your tag turned out beautiful. That fabric flower is sooo gorgeous, Trace! Love this tag!!! Love the stamping on the canvas...great tag. I love vintage, I love shabby chic and this is right up my alley! Gorgeous tag, Trace! Love the flower with the Bingo chip center! That calico flower is really gorgeous - great vintage tag.